This guide outlines Gleeson Library's necessary cancellation and withdrawal projects. 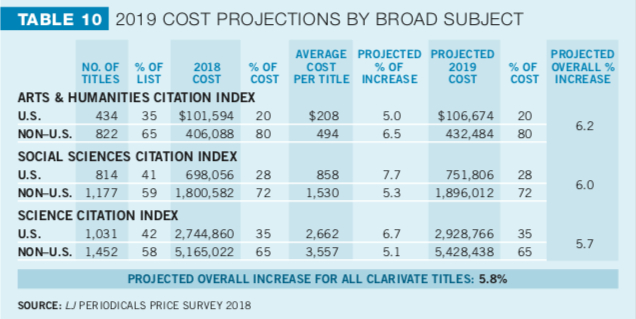 Scholarly journal prices are projected to increase by 6% in 2019 (see chart below), while the library materials budget has decreased over the past three fiscal years. Given the budget projections faced by the university for FY20, Gleeson Library is preparing for a significant cut to our acquisitions budget, which, coupled with the predicted subscription price increases, means we may need to reduce our annual materials expenditures by as much as 15%, or roughly $350,000. We plan to do this through cancellation of databases and e-journal packages, as well as eliminating any one-time expenditures (including books, journal backfiles, etc.) paid from unrestricted funds. We are not alone; SPARC (the Scholarly Publishing and Academic Resources Coalition) has created a database to track large journal package cancellations. Unless something changes dramatically, we anticipate such subscription cancellations will be an annual process. We have analyzed the last several years of cost and usage data for our databases and e-journal package subscriptions. This data will be used to identify the needed cuts that will have the lowest impact on our faculty and students. During the months of November and December of 2018, library liaisons will review and identify potential databases and e-journal packages for cancellation. The list of materials selected for cancellation (see tabs at bottom of spreadsheet) will be shared with departments and schools who will have the opportunity to review and share their input by the end of February 2019. Subscriptions to database and e-journal packages will be cancelled in March 2019, with access to these resources ending according to their subscription period (many through December 2019). We realize that cancelling subscriptions will have an impact on teaching and research needs of our students and faculty. Journal articles may be ordered by members of the USF community through document delivery services. As part of our efforts to reduce costs, the library will also be withdrawing roughly 25% of the bound journal volumes that were moved to off-campus storage in July 2017. These items needed to be put in storage to accommodate several new departments that moved into the library building. The library has analyzed our print journal holdings and will be withdrawing from offsite storage the volumes that are duplicated in JSTOR or other permanent online archives previously purchased by the Library.